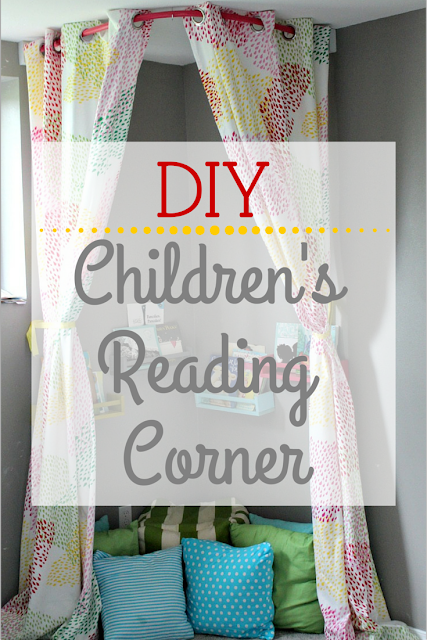 I have always loved little reading corners and nooks. I always made sure that I had them in my classrooms when I was teaching. Who doesn't want to curl up with a good book?! In our old playroom, we had this perfect little spot where the roof of the house slanted down. 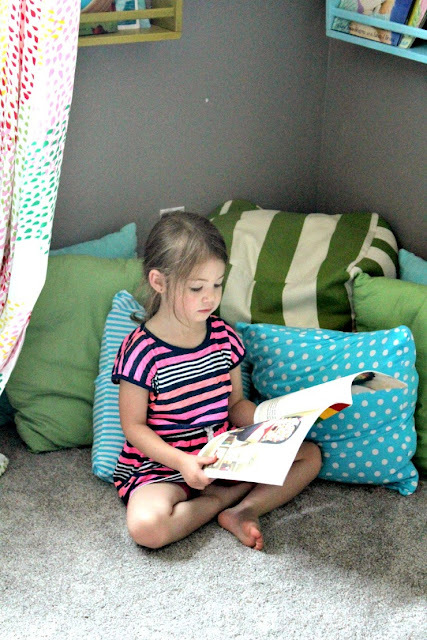 Before we re-did the room, it was filled with built in shelves, but we took them out, put a covered crib mattress and tons of pillows in and made it into a reading nook and I loved it so much! In this house, I knew I wanted to do a reading corner in our playroom because my girls had loved the nook so much. 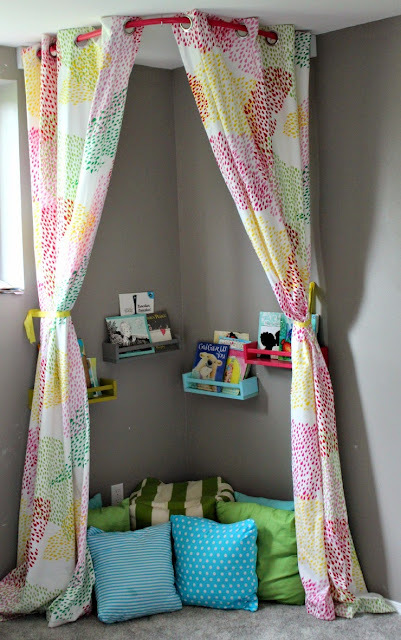 This unintentionally became an Ikea reading corner along the way as we collected things! We didn't mean to but we had just randomly picked things up there over the years that worked! So here it is! 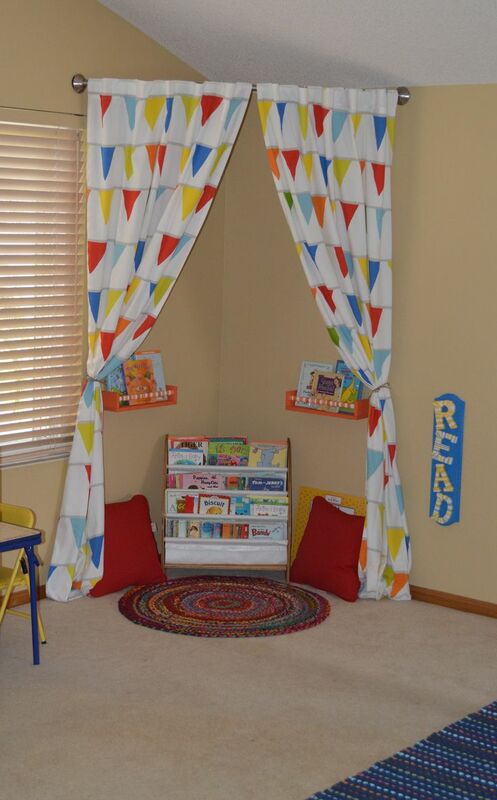 Our bright and cozy children's reading corner! 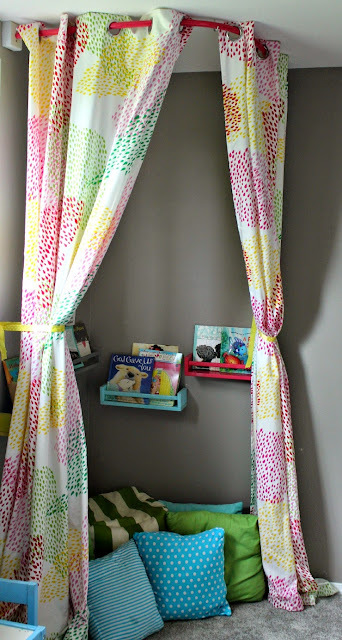 I had seen this on Pinterest which inspired me to do the curtains in the corner. But let me tell you--it is a Pinterest FAIL! 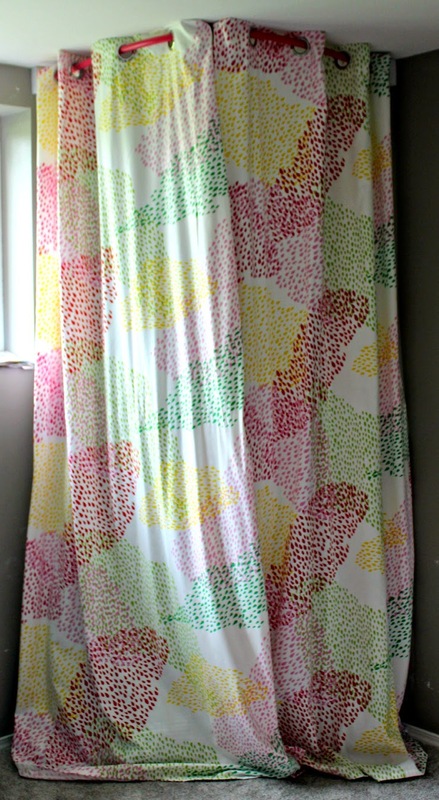 A curved shower rod WILL NOT WORK in a corner! It needs to go against parallel walls because of the way it is curved. I have no idea what they did in this room to make it work. My handy hubby said he could craft something up as we returned the shower rod to the store, so we picked up some PVC pipe and a hook. At home, we cut and spray painted the PVC pipe, and my husband cut 2 blocks out of a 2x4 to hang them on. He used a hole saw to make holes the size of the pipe in the blocks, then drilled the blocks into the wall, and put the pipe in either side. 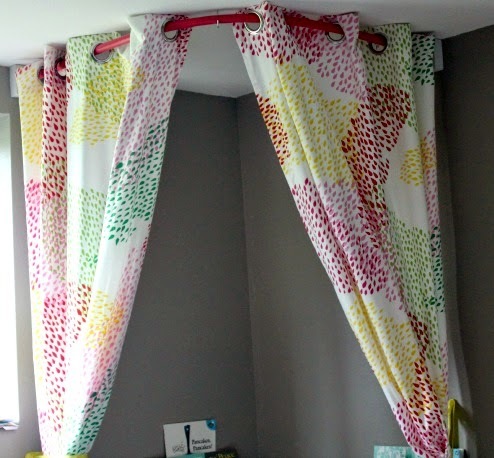 Now it looked perfect, but once we hung the curtains, it drooped a bit, so he got the hook, and hung it upside down from the ceiling and that helps hold up the center of the pipe! It was really quick and easy and it hasn't even budged since last summer or fall when we made it! 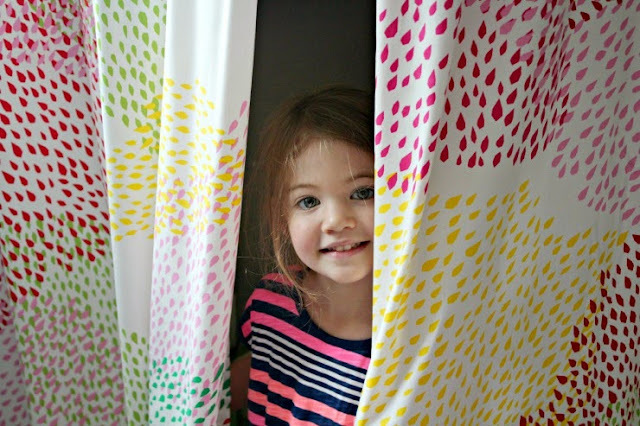 I love this little area because if you let the curtains hang it can be a private little area, or even could be used for plays or puppet shows in a few years! The book shelves are the famous Ikea spice racks spray painted. I just used whatever colors I had on hand, spray painted all the parts, let them dry and then put them together and my husband hung them. 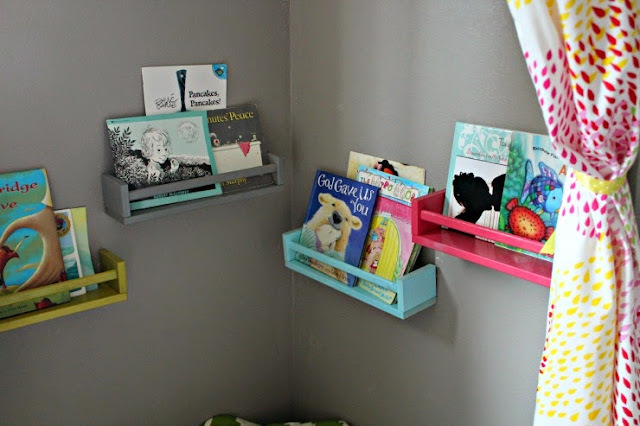 $16 for 4 of them beats the price on any book shelf I have seen, and way cuter! Pillows are just a mish mash of ones I had at the old house that we had collected for the playroom over the year, and covers I made. 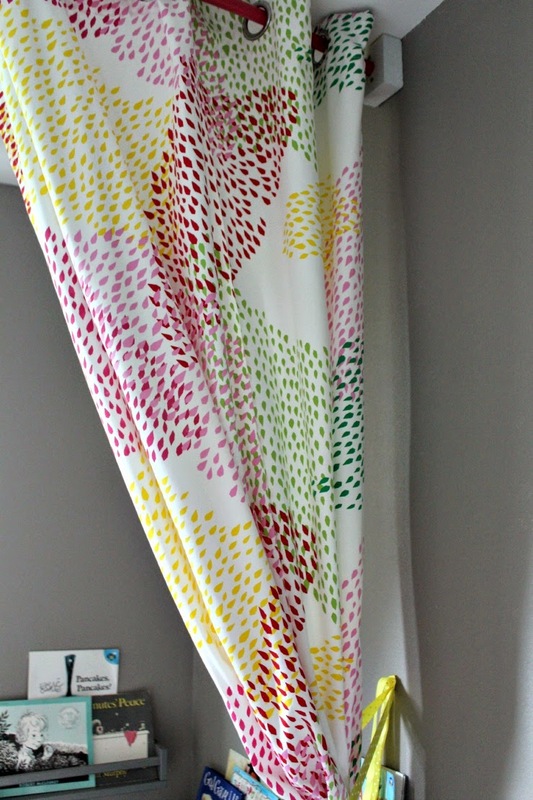 The curtains are Ikea Murgrona panels. I had picked them up intending to use them for the playroom closet and loved how bright and colorful they were...not to mention affordable! 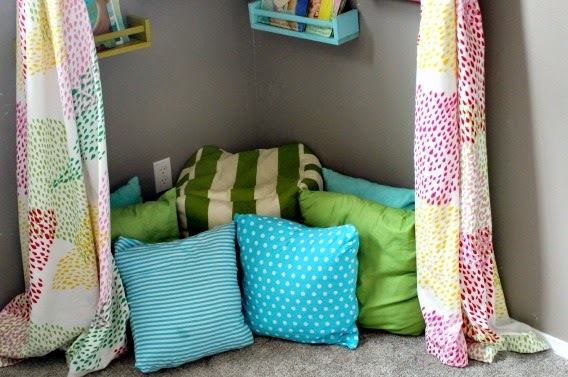 It's the perfect cozy spot to curl up with a book!